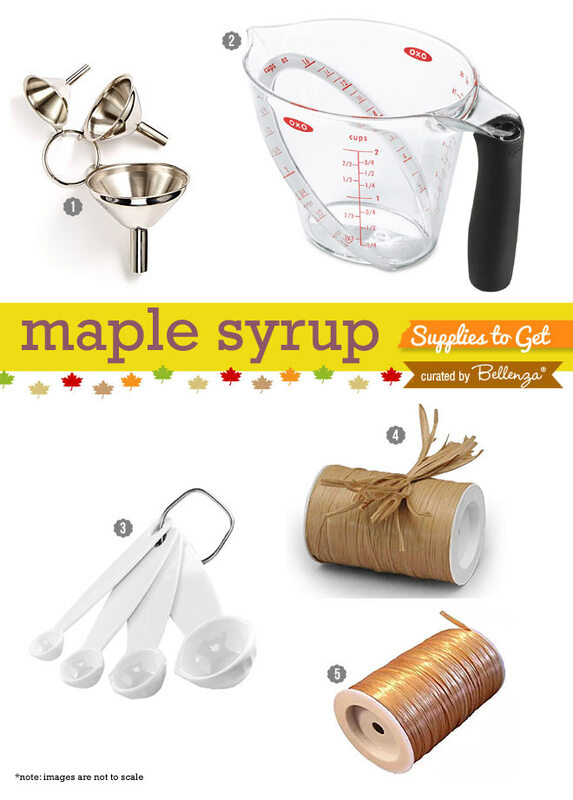 Home / Packaging Favors & Gifts / Maple Syrup Favors in a Bottle: Ideas To Buy or DIY for Fall! Whether your home state is a “maple syrup capital” or not, these signature gifts of the season are a lovely way to mark your autumn nuptials. See these pre-packaged finds! 1 – Pure Maple Syrup in Painted Glass Bottles – This unique selection from Fuller’s Sugarhouse has pure New Hampshire maple syrup in painted glass bottles – your choice of a moose, maple leaf, covered bridge, or old man in the mountains design. 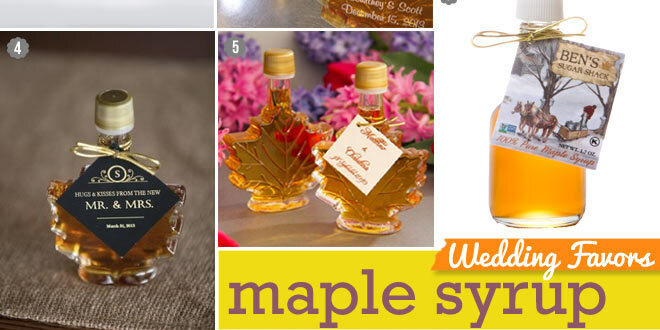 2 – Bulk Maple Syrup Wedding Favors – At Carman Brook Maple Farm, they offer a wide range of maple syrup favors with a minimum bulk order of 24. 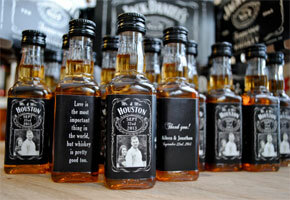 They provide different bottle styles and materials to choose from, and the option to have custom engraving. 3 – Vermont Maple Syrup in Glass Bottles – This Vermont 100% pure maple syrup from Purinton Maple is boiled over a wood fire evaporator to create an enhanced flavor. The smallest size at 8.5 fl.oz. 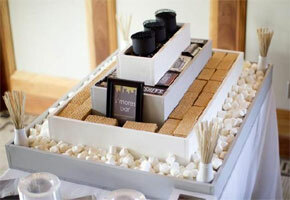 is perfect for favors. 4 – Pure Vermont Maple Syrup in Glass Maple Leaf – You can order a case of 48 50-ml glass maple leaf bottles from Red Leaf Hollow Farms, filled with Dark Amber Pure Vermont maple syrup. Hang tags are ordered separately. 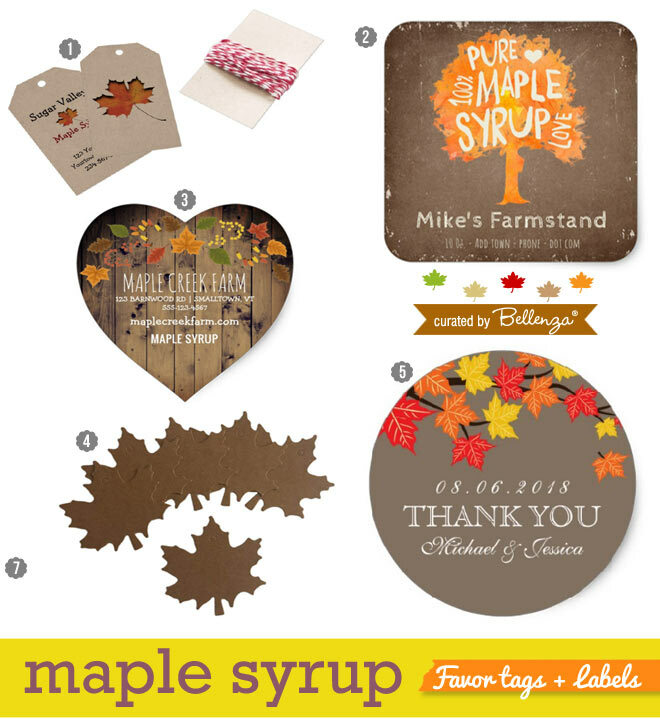 5 – Mansfield Maple Vermont Wedding Favors – Available in sets of 24 from Amazon, these pretty 50ml leaf-shaped bottles are trimmed with personalized favor tags. 6 – 1.7 oz Maple Syrup Glass Nip Bottle with Handle – From Ben’s Sugar Shack via Amazon, 100% pure maple syrup comes in this rustic-style nip bottle trimmed with a hang tag (option to have a custom design, if you wish). 7 – 1.7 oz. Heart-shaped Nips – Love is sweet indeed! Another unique packaging idea for maple syrup favors comes courtesy of The Sap House at Stone House Farm—nip bottles in the shape of hearts. 8 – Bottled Maple Syrup with Scallop Hang Tag – This isn’t actually a “to buy” option for the entire packaging (image from Evermine). But the scallop, burlap-look hang tag completes the favor look so sweetly, don’t you think? 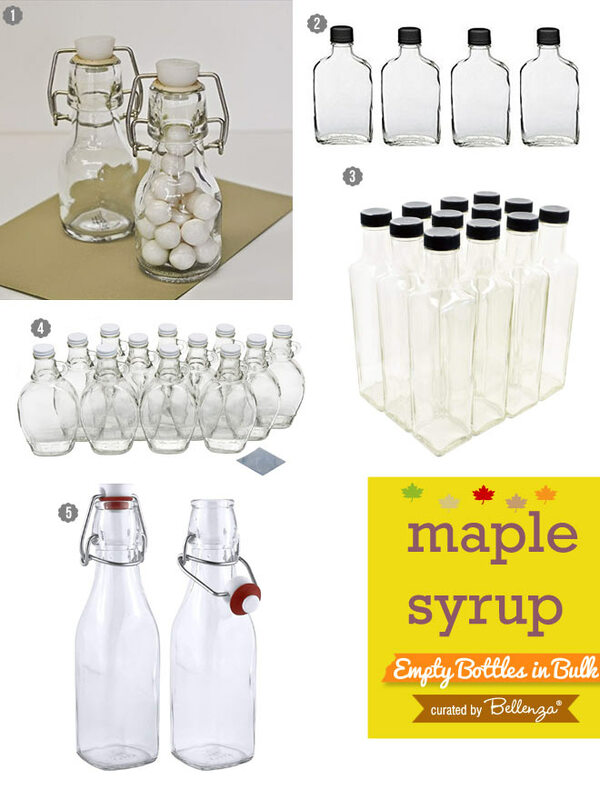 9 – Maple Syrup in Maple Leaf Bottle – Springdale Maple Farm Products provides several bottle sizes and designs to choose from. This is their 50 ml maple leaf design that makes such a pretty favor option. 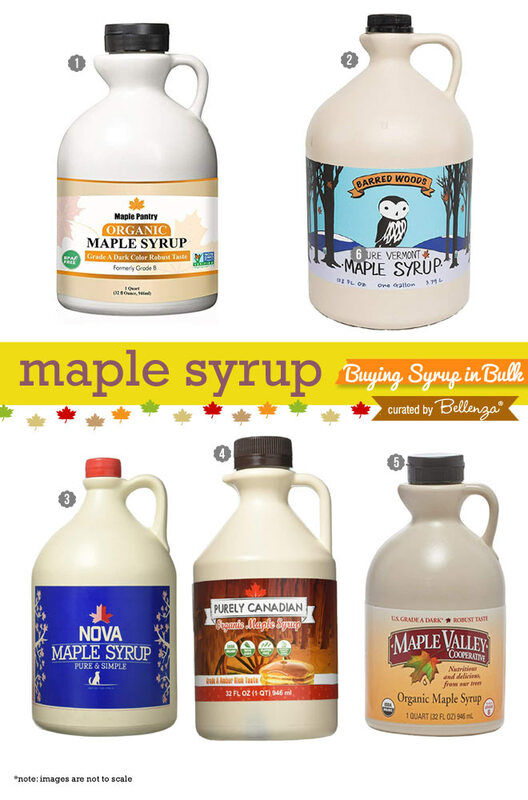 10 – Mini Maple Leaf Syrup Bottle – From the trees of New England, World Market brings you pure Vermont maple syrup in sets of 6 50ml mini leaf bottles. 11 – Vermont Maple Syrup, Medallion-shaped Favor – Consider this delightful mini syrup favor from Pieces of Vermont that features a unique round-shaped bottle, embossed with a maple sugar leaf and decorated with ribbon and a custom tag. 12 – Bourbon Barrel Aged Maple Syrup – Here’s something different! Grade A Dark Amber organic maple syrup that has been aged in bourbon barrels at craft distiller Sherman Hollow Farm. No alcohol, just the rich flavor of bourbon in this 8.45 oz jug. 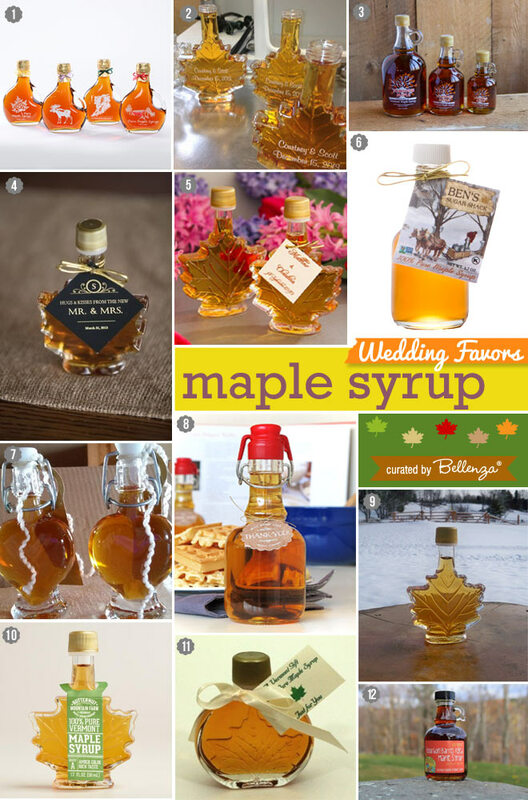 Prefer to try your hand at packaging your own maple syrup wedding favors? Here are the basic supplies you will need. Look at the lovely options we found! 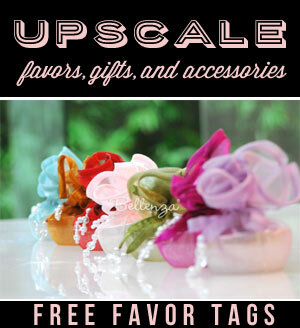 Take your pick from the varied shapes to give your favors that extra appeal! Now, to fill those bottles with sweet syrupy goodness! See these options to buy in bulk. To make the DIY job easier, you’ll be needing these handy aids. While ribbon and twine will make the perfect finishing trims for your favors! Previous Fall Wedding Guide to Planning an Elegant Affair! Next Writing Your Own Personal Wedding Vows: Tips for Couples!